Day Spa treatments include both massage and facials. In most cases these will be performed by different therapists. Please call to schedule your appointment so we can customize the experience to your liking. If you do book online, you will only see one therapist's name when booking. Learn more about Kur's Day Spa Packages here! Ayurvedic Massage, Sugar Scrub, Steam Shower, Ayurvedic Facial, all for your specific dosha. 90 min Deep-Tissue Massage, Aromatherapy, Warm Oil Scalp, Unstress Facial. Performed in two rooms connected by a couple’s window. Kur Wellness Studios provides a full menu of massage, skin care and waxing services with a unique yoga studio that doubles as a private personal training gym. A new and different wellness center, Kur offers both traditional and "eastern" services such as Ayurvedic treatments and products to ‘gentle’ yoga on our Yoga Wall. 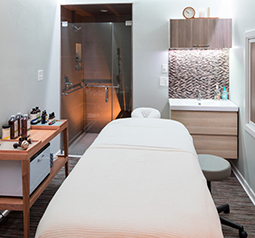 Located in downtown Asbury Park, Kur offers services in a tranquil, yet hip, urban setting. All while surrounded by the best team of practitioners around - each with positive attitudes and true commitments to health.